With AKVIS Stamp 1.1 digital image retouching has become more fun than work! 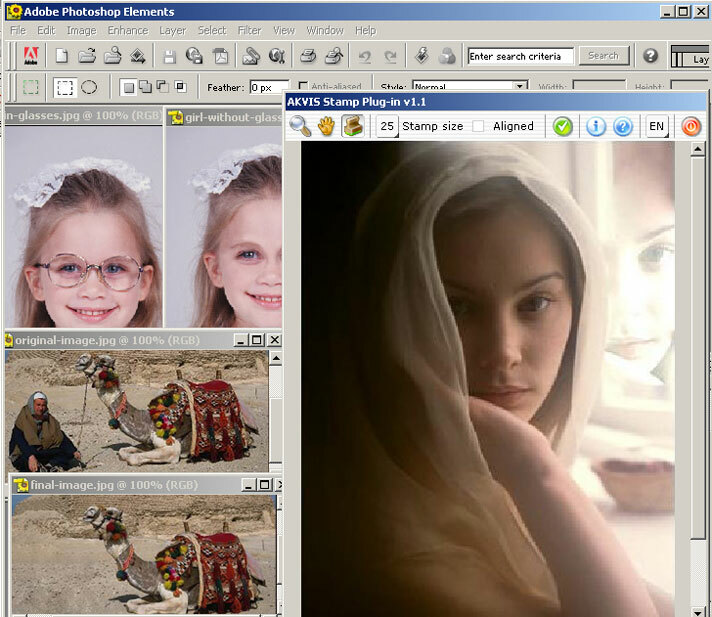 AKVIS LLC today announced the release of version 1.1 of AKVIS Stamp, a new image healing/cloning tool in the bestselling family of image processing applications. The application helps users of any level of computer competence to seamlessly remove image defects and clone objects with a minimum of efforts. With its unique intelligent blending functionality, simplicity of use and affordable pricing, AKVIS Stamp far exceeds any currently existing clone application. AKVIS Stamp v. 1.1 enables users to bring to life old photos or simply remove unnecessary elements in digital images by using same-image areas to touch up spots, scratches, wrinkles and scars. Utilizing advanced blending technology, the plug-in helps to automatically fuse the recovered clone area with the target background so that the user doesn't have to adjust its color range, texture and brightness by hand and the resulting image looks natural and solid. The simplicity of clone area fusing will be of great value for professional designers who may use the plug-in in creating complex pictures and collages with incredible stylistic effects. For all the technological sophistication, using AKVIS Stamp is fairly easy as the program interface is designed with such simplicity. The plug-in is intended for a diverse spectrum of digital imaging software including Jasc Paint Shop Pro, Corel Photo-Paint and earlier versions of Adobe Photoshop and gives the chance to gain the functionality of the most up-to-date graphic platforms at the price of only $49 (USD). For more information on AKVIS Stamp v.1.1, please visit http://akvis.com/en/stamp/index.php. "I have downloaded the trial version of the Stamp tool. I'm extremely impressed with the product by the way it represents excellent value for money!" - said Helmut Heidtke, a professional photographer. "Your Stamp works very well against many different image healing products and gives outstanding results. It used to take me hours to recover some photos but now that I have this tool I can do the same thing within minutes. I would highly recommend AKVIS products to anyone who needs a good quality". The application runs under Windows 98/Me/NT/2000/XP and costs $49 (USD) for a single-user license. Registered users are entitled to free updates. The 10-day fully functional evaluation version of AKVIS Stamp v.1.1 can be downloaded for free at http://akvis.com/download/akvis-stamp-setup.exe. AKVIS LLC is a software development company focused on producing innovative digital imaging solutions with the primary emphasis on quality and simplicity of use. We have a team of talented programmers and designers who are committed to make AKVIS solutions the golden standard in digital imaging. The company's highly successful product family includes AKVIS Retoucher, AKVIS Chameleon and AKVIS Stamp.